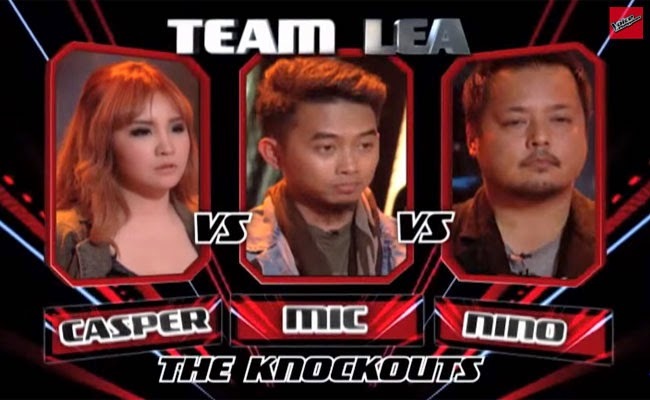 The battle of the artists in Team Lea continues as The Voice if the Philippines Season 2 continues on with the Knock Out Rounds. The camp headed by Coach Lea will be divided into three on January 11, 2015 to see who among them will belong to the Top 6. The second group had been called on. Casper Blancaflor sang ‘Bring Me To Life’, Mic Llave performed the iconic song ‘Anak’ and Nino Alejandro made his own rendition of ‘Love Hurts’. Lea chose them to be in one group because of their level of their ‘musicianship’. Casper was stolen by Lea from Camp Kawayan because her voice was one of a kind. Lea told her that her microphone should not be in awkward position and she must not look like she’s having a hard time. During rehearsald, Mic had made Lea proud. She said that he seemed attached to the song. She thinks that it could easily reach out to the listeners. Nino is a four chair turner. The song he had chosen thought that it could showcase his voice the best. Sarah said that Casper had given off more inspiration. Bamboo agreed again with her and said that Casper must smile more. Apl said that Nino had a unique rock and roll voice. Lea then decided Nino and Casper must stay. Nino Alejandro and Casper Blancaflor will be moving on to the Live Shows together with Timmy Pavino and Leah Patricio as part of Team Lea’s Top 6.